Have no fear of robbers or murderers. They are external dangers, petty dangers. We should fear ourselves. Prejudices are the real robbers; vices the real murders. The great dangers are within us. Why worry about what threatens our heads or purses? Let us think instead of what threatens our souls. My coat and I live comfortably togther. It has assumed all my wrinkles, does not hurt me anywhere, has moulded itself on my deformities, and is complacent to all my movements, and I only feel its presence because it keeps me warm. Old coats and old friends are the same thing. I met in the street a very poor young man who was in love. His hat was old, his coat worn, his cloak was out at the elbows, the water passed through his shoes -- and the stars through his soul. There are no trifles in the human story, no trifling leaves on the tree. Where the telescope ends the microscope begins, and who can say which has the wider vision? Work, which makes a man free, and thought, which makes him worthy of freedom. Popularity? It is glory's small change. Love is like a tree, it grows of its own accord, it puts down deep roots into our whole being. Do you know what friendship is... it is to be brother and sister; two souls which touch without mingling, two fingers on one hand. He who abandons the field is beaten. Nothing discernable to the eye of the spirit is more brilliant or obscure than man; nothing is more formidible, complex, mysterious, and infinite. There is a prospect greater than the sea, and it is the sky; there is a prospect greater than the sky, and it is the human soul. 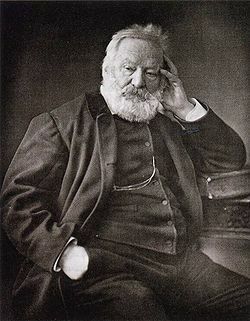 48 quotes by Victor Hugo.